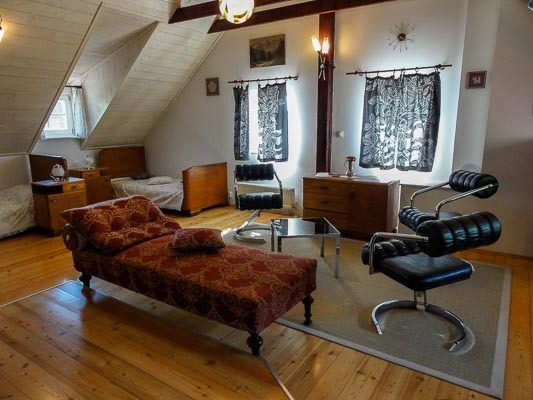 Nicely styled Tagrajska Apartment is a part of a 400 year old house with one of the most exquisite locations in town. Placed in the middle of the castle hill it offers gorgeous views of the city. There is a fairytale garden adjacent and 5 minutes of walk to the old town on one side and the Ljubljana Castle on the other. If you do not mind the 150 stairs leading to the old town, you will fall in love with this place. This luxury penthouse apartment of 55 m² consists of 4 beds + 1 extra if required. It is freshly redone and tastefully decorated, in keeping with this historic building from 1600. 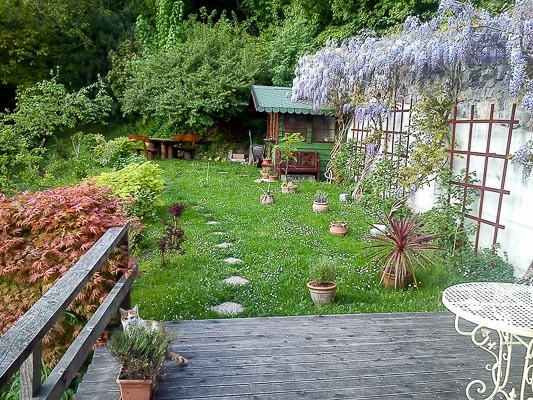 You can relax in the garden to the rear of this building – an oasis in the very centre of Ljubljana, with views up to the castle forest. The material of the house is authentic stone (that the castle hill is made of) and Slovene wood, which adds up to the natural feeling of the place. Rooms are non-smoking but there is a designated smoking area. Free WiFi is available in all areas and is free of charge. Please inform Apartment Tagrajska in advance of your expected arrival time. You can contact the property directly with the contact details provided in your confirmation. This fairy tale house placed in the middle of the castle hill offers a bit of a village ambience right in the town centre. There is a children’s playground a minute away. A short 5 min walk following the path passing the apartment house brings you to the Castle of Ljubljana with its ancient chapel, exhibitions, restaurants and a cafe. There is also a souvenir shop and a magnificent view of Ljubljana from the top of the lookout tower. There are a variety of paths directing you up to Tagrajska Apartment. Descending by the 153 stairs, you will find yourself right in the old town with numerous restaurants, bars, shops along the river Ljubljanica. Some other attractions like theatres, galleries, museums, and Preseren Square are just a stone`s throw away.